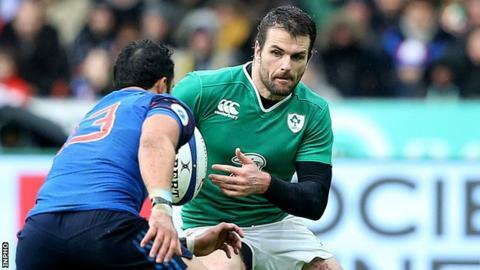 Jared Payne remains a fitness doubt for Ireland's Six Nations game against England at Twickenham on Saturday after missing training on Tuesday. Centre Payne instead had treatment on his hamstring injury after taking part in Monday's training. "He trained probably 85 to 90 per cent yesterday and ran well," Ireland's forwards coach Simon Easterby said. "Today he's going to do some work with the physios and we'll give him until Thursday to prove his fitness." Payne, 30, was initially thought to have suffered a dead leg in Ireland's 10-9 defeat by France but it was later diagnosed as a hamstring problem. If Payne is ruled out, his Ulster colleague Stuart McCloskey will be in contention for a first cap although fit-again Keith Earls and Luke Marshall will be other options for coach Joe Schmidt. Earls has beaten the concussion that kept him out of the game in Paris, and stepped in at centre when Payne suffered a foot injury during last year's World Cup. McCloskey is the form centre, however, with the 23-year-old's physical presence catching the eye for Ulster this season. Ireland would most likely have to shift Robbie Henshaw to 13 to accommodate McCloskey in his natural inside centre role. Props Mike Ross and Cian Healy are available to bolster the scrum after missing Ireland's first two games. The Irish scrum struggled badly in the second half of the defeat by France and the return of the Leinster duo after injury will be a boost to coach Schmidt. Loose-head Healy has returned to Leinster duty in recent weeks after knee surgery while tight-head Ross has recovered from hamstring trouble. Fears over Johnny Sexton's fitness have eased and he trained fully on Tuesday after picking up a neck injury in Paris and then straining an ankle last Friday. Ross and Healy join Ulster wing Craig Gilroy plus Munster lock Dave Foley and Leinster flanker Jordi Murphy in being added to the Ireland squad for Saturday's contest. Simon Zebo, who started in the draw against Wales, is in contention for a recall after missing the defeat by France because of injury. Sean O'Brien, Dave Kearney and Mike McCarthy have all been ruled out of the remainder of the tournament after picking up injuries in the France game. Ulster flanker Chris Henry remains a notable absentee, despite starting for his province in the defeat by the Scarlets. After the daunting match against England, Schmidt's side then finish their campaign with home games against Italy and Scotland on 12 and 19 March. The holders' chances of retaining the title they won in 2014 and 2015 look remote, with just one point from their opening two fixtures. Ireland squad: Forwards: Finlay Bealham (Connacht), Rory Best (Ulster), Sean Cronin (Leinster), Ultan Dillane (Connacht), Dave Foley (Munster), Cian Healy (Leinster), Jamie Heaslip (Leinster), Jack McGrath (Leinster), Jordi Murphy (Leinster), Tommy O'Donnell (Munster), Mike Ross (Leinster), Rhys Ruddock (Leinster), Donnacha Ryan (Munster), CJ Stander (Munster), Richardt Strauss (Leinster), Devin Toner (Leinster), Josh van der Flier (Leinster), Nathan White (Connacht). Backs: Keith Earls (Munster), Craig Gilroy (Ulster), Robbie Henshaw (Connacht), Paddy Jackson (Ulster), Rob Kearney (Leinster), Ian Madigan (Leinster), Kieran Marmion (Connacht), Luke Marshall (Ulster), Stuart McCloskey (Ulster), Fergus McFadden (Leinster), Conor Murray (Munster), Jared Payne (Ulster), Eoin Reddan (Leinster), Jonathan Sexton (Leinster), Andrew Trimble (Ulster), Simon Zebo (Munster).